Violins, along with the rest of the String family, (violas, cellos and basses) are an integral part of the Symphony Orchestra. The instrument is commonly associated with classical music, but there are other genres such as blue grass, folk and various styles of “fiddle music”. It’s also occasionally heard in blues, jazz and rock. Contrary to some popular beliefs, the violin is not a particularly difficult instrument to play, and with consistent practice beginners usually make rapid progress, playing simple melodies relatively quickly. 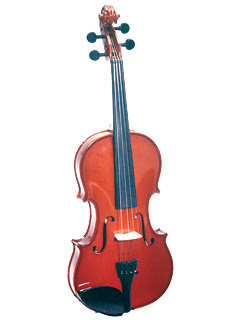 The violin is particularly child-friendly in that it comes in a variety of sizes. As a student grows, the instrument can be traded for larger sizes. It’s critical that a student has the proper size instrument. A violin that is too large in proportion to the size of the student can create a very uncomfortable situation. In extreme situations, this can lead to tendonitis leaving students discouraged and turned off to the instrument. These violins are produced for beginning students and are often produced by machine. Maple is sometimes used for high friction parts (pegs, fingerboard) and dyed to resemble the more expensive Ebony, which is found on most violins. These instruments are excellent for the early stages of development and are priced to easily fit into most budgets. These instruments represent better quality wood and workmanship, most (if not all) of which is done by hand. The result is an instrument that sounds better and will accommodate a player to more advanced levels of play. Pegs and fingerboard are usually made of Ebony. 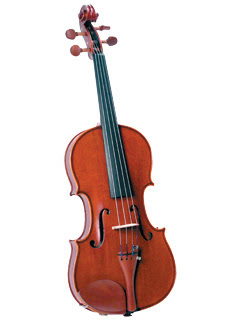 Extensive hand graduation of the top and back of the violin result in a more refined sound. Some intermediate violins may approach the professional level of performance. These are violins made from only the finest woods and built with a near fanatical devotion to every detail of the instruments construction and appearance. Because of the relatively low number of craftsman skilled at this level, and the number of hours required to produce an instrument of this caliber with a select piece of natural wood, the price of these instruments is considerably higher. * Neck Assembly – the structure that attaches to the top end of the violin body. It is generally made of maple and has at the top-end, the peg box (where the strings attach to the pegs) and the scroll. Applied to the top of the neck are the fingerboard (where the left-hand fingers press down to alter the pitch of the strings) and the nut (a small piece of wood that supports and separates the strings just as they pass into the “peg box”). * Soundpost – a small cylindrical piece of wood that is fitted and wedged between the back and face of a stringed instrument. Its placement has a great effect of the sound of the instrument. * F-Hole – Two holes precisely cut in the top of a stringed instrument to permit the sound to be projected from the interior of the instrument. * Tailpiece – a long tapered piece of material suspended above the top of the violin by the ends of the strings at the bridge end, and the tailgut at the button end. "Finding an all solid, hand-carved, violin outfit using premium aged, flamed and book-matched woods has been unheard of until now. Now thanks to Saga, this is an amazing instrument that all can afford. "Owning a violin by Guarnerius is a dreamed shared by all violin players whether they are budding students or seasoned professionals. 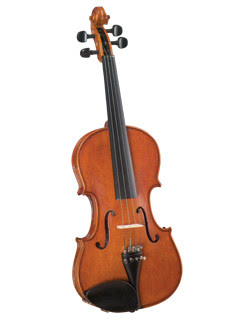 Now is your chance to actually own a piece of history in the new SV-360 violin outfit from Cremona. Faithfully recreating the maker�s most valuable works, this violin will surely impress. One look and you will know its history, one listen and you will start making your own. 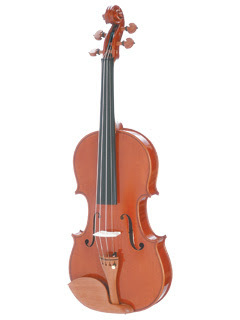 Our quest to make best selling student violins began over 25 years ago with our desire to offer the finest quality, player worthy and affordable bowed instruments to the retail public. Since those early days we have continued to produce quality instruments with the player in mind. It is this unique view that has helped Cremona become one of the most popular lines of violins in the world. Each outfit gets a beautiful new translucent, warm brown finish. This complicated and thinly applied finish brings out the incredible grain patterns found in the tight grained spruce and select maples used in each of these outfits. The new LB-15 bow, made of the finest Brazilwood-perfectly octagonally shaped and well balanced-provides for a very resilient and responsive bow with better bounce and control. "* Hand carved solid spruce top * Hand carved solid maple back, sides, neck, and scroll * Ebony fingerboard and ebony pegs * Inlaid purfling * Anodized aluminum tailpiece with 4 fine tuners * Fiberglass bow and genuine horsehair * Ultra-light featherwieght case"
* VP-61 alloy Fine Tuner Tailpiece"
"Wonderful beginner violin at a great price! Solid Carved solid spruce top * Solid carved maple back, sides, and neck * Hardwood Fittings * Warm Brown Finish * Bakelite Chinrest and Tailpiece * Wood bow with horsehair * Hardshell case"
"We have included these beautiful instruments to our collection because we feel the quality of both is exceptional. The SV350 is a perfect replica of a fine, old Stradivarious, the SV360 is a replica of the Guarerius style. Twenty coats of fine, pale-amber varnish ensure visual beauty as well as the finest possible tone. The top and back are hand-graduated by experts, and the workmanship is first rate inside and out. 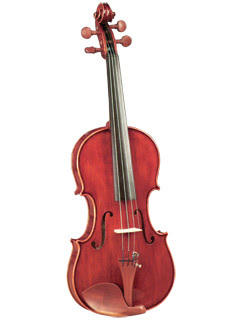 * C-3903 deluxe oblong case"
Cremona violin outfit, ideal violin for the beginning player. Includes one free lesson and guaranteed trade in. 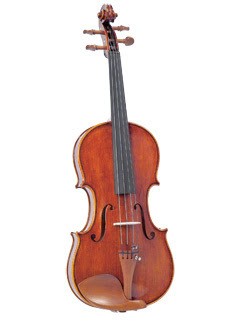 This violin is made by Cremona..a leading maker of fine stringed instruments. Feature include hand carved solid spruce top and hand carved maple back, neck and scroll. The bow is a H. Siegler wooden bow with genuine unbleached white horsehair. They are available in all sizes 1/16th through full, and come complete with case, bow, rosin and four fine tuners. We even offer a trade up to the next size when you are ready. 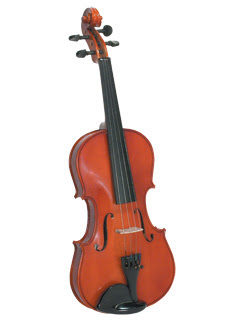 These violins meet or exceed all Music Educator's National Conference specifications for stringed instruments. You will not find a better violin for the price. 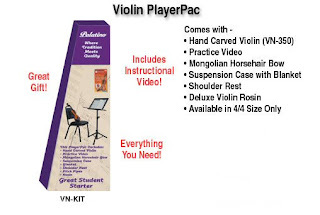 "Stock up for schools now with this perfect, entry level violin outfit. All fittings and woods are selected to assure that it outperforms our competitors similarly priced products. This deal also includes one free e mail lesson as well as our guaranteed trade in plan!"